Super lightweight stands for audio and lighting? The larger Video Mic was already a superb microphone, and the Pro version, despite being much smaller, was as directional in its sound gathering, and just as clear in picking up all the detail in the voice. If anything, the Pro seemed to make a little less background hiss in the quiet times, as the camera turned up the gain automatically. If absolute quality is needed in audio, then currently with the video DSLRs on offer, the only answer is to record the audio separately and then sync it up afterwards when editing. I personally use a Zoom H4n audio recorder and Rode’s excellent NTG-3 microphone. However, this is extra equipment and expense, and demands a lot of extra time and expertise when editing. 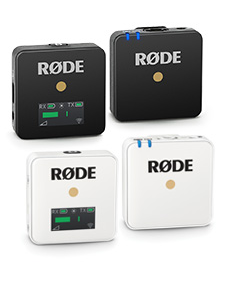 For simpler straight-to-camera recording, Rode’s Video Mic Pro has kept the superb sound of its older brother and packed it into a much smaller package. The smaller size naturally has its conveniences; it’s much harder to snag the microphone and takes up less room when packed. The shorter size also means that it’s now much easier to use ultra-wide-angle lenses. I really can't fault the sound coming from this microphone... It's a mono microphone and is surprisingly good at picking up the spoken voice with good clarity, even in a noisy room. There will always be times when the budget doesn't run to a sound recordist and radio mics aren't practical. I find this the perfect microphone for run and gun shooting outside churches, at receptions etc. 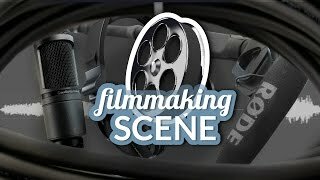 If you're getting into serious video making then you're going to have to record good audio. 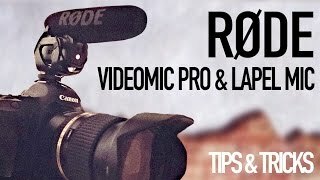 The RØDE VideoMic Pro is a great place to start. 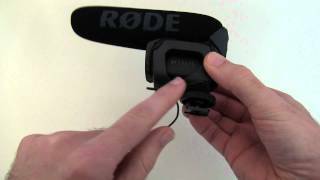 Simply put, the RØDE VideoMic Pro is great for cameras lacking good audio quality. Straight out of the box this microphone is easy to use, with no confusing parts or complicated assembly. Pull it out, slide it onto the cold shoe mount it on your camera, connect one tiny cord with an 1/8-inch plug and flip on the power. An immediate challenge with high quality microphones is the vibration the microphone picks up. 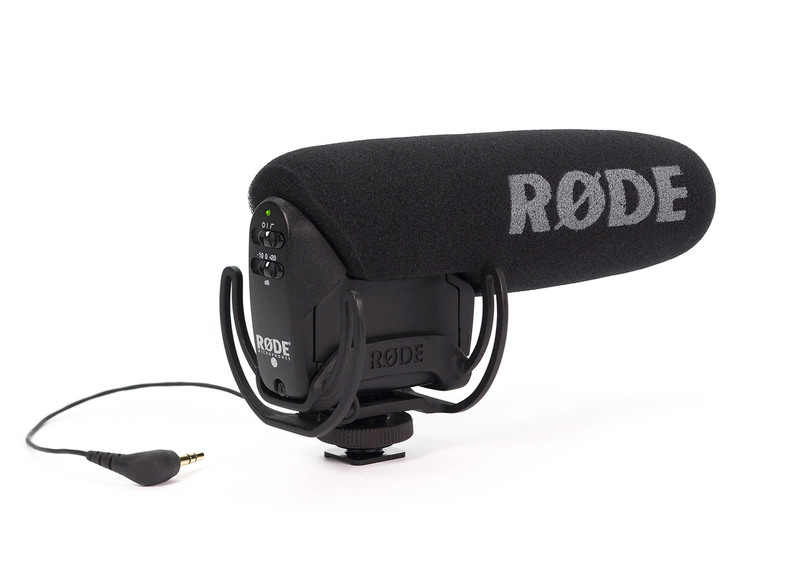 A nice selling point of this RØDE VideoMic Pro is its built-in shock mount. The sleek and compact shock mount doesn't get in the way of performance, nor does it dominate the top of the camera. The shock mount does, however, do a great job of protecting the microphone from vibration that can cause audio blips, such as when the tripod is bumped accidentally. In comparison with other similar microphones the RØDE VideoMic Pro met our expectations and performed very well. Simple to use, small and out of the way, it produces professional quality audio recordings... this RØDE VideoMic Pro is at the top of its class and is a great purchase. 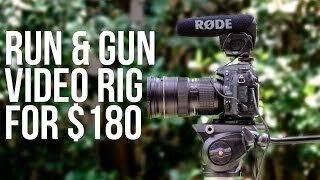 Adding the affordable RØDE VideoMic Pro shotgun to your video-capable DSLR will improve the audio on your project without becoming too complicated. With only half an inch in length and a weight of three ounces, you're adding very little weight to your camera while gaining superior sound. The super-cardioid directional abilities of the shotgun mic amplify cleaner audio from the source while reducing ambient noise. There's also a +20 dB level boost switch on the rear that has been designed specifically for use with DSLR mic jacks. When I reviewed Canon's 5D MkII in 2009, I concluded that the easiest way to get good audio on the camera was to use Rode’s VideoMic. I’ve been personally using this microphone since and have been getting pretty good results. However in situations where I need to travel compact or when shooting in news type situations, I did wish the VideoMic was smaller. 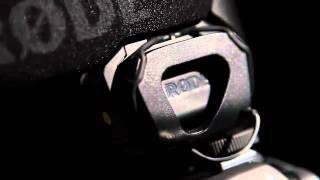 Rode seems to have been listening and recently launched the much smaller VideoMic Pro. It’s 10cm shorter in length than the VideoMic, 2.2cm lower in height but 0.7cm wider. It’s also lighter with the new model being 85g compared to the VideoMic’s 176g. It is just the right size now and when mounted, it doesn’t stick out the back. 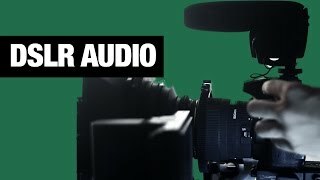 I did a set of extensive listening tests comparing the VideoMic and VideoMic Pro, using a Canon 5D MkII with it’s audio gain set on automatic. The subject was in an enclosed area and recorded from a distance of 2 meters as well as one meter. 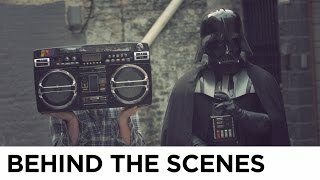 I listened to the results playing back the video on a MacPro using Aperture 3. Initially I used a pair of speakers and then headphones. No matter how hard I tried to find differences between the two, I couldn’t. The larger VideoMic was already a superb microphone, and the VideoMic Pro, although much smaller, was as directional in it’s sound gathering and just as clear in picking up all the detail in the voice. If anything, the VideoMic Pro seemed to make a little less background hiss in the quite times, as the camera turned up the gain automatically. As a result, it later came as no surprise when comparing the specifications of the two microphones to see that Rode have somehow managed to make them identical, even though the VideoMic Pro is so much smaller. In listening tests, although I didn’t do a side by side comparison with it’s closest rival, the more expensive Sennheiser MKE 400, although I had previously tested the Rode VideoMic and in comparative listening tests, the Rode was the clear winner. The new microphone is a completely different design, with a completely new suspension rig, which ensures camera noise doesn’t vibrate up to and get recoded by the microphone. I’m extremely glad to see that the on switch and all the filter controls are still at the back of the camera, where they are easily seen. There’s nothing worse that making a video recording and not switching on the microphone; with the Rode, an LED clearly shows when it’s on. The Sennheiser has these controls on it’s side where they are easily missed. The smaller size naturally has it’s conveniences; it’s much harder to snag the microphone and naturally it takes up less room when packed. The shorter size also means that it’s now much easier to use ultra wide angle lenses. Even when doing dual audio, I still use the VideoMic Pro on a second body when shooting dual cameras (which I often do); this allows for a sound backup but also for a much cleaner audio track to synchronise externally recorded audio with. For the simpler and straight to camera audio recording, Rode’s VideoMic Pro has kept the superb sound of it’s older brother and packed it into a much smaller package. 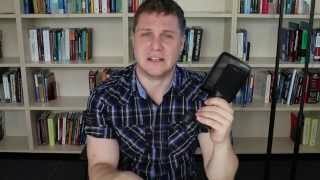 I highly recommend this to anyone wanting to use their DSLRs for video. The biggest feature of the microphone that sets it clear above its predecessor is the fact it has a built in attenuation and boost functionality to work with a wide variety of situations and equipment. A -10db PAD and 0db settings are great for loud sources or environments where clarity is not an issue. At -10db and 0db, the sound quality is similar to the older model that does not contain any settings. Where the microphone shines is setting it to the level boosting +20db setting, providing a clear and clean boost for poor quality pre-amp inputs such as those found on DSLRs and Camcorders. This allows the user to set the recording levels to a much more moderate setting, meaning a lower noise floor and a cleaner audio signal into your recording. If you are looking for a small compact microphone to improve the quality of your compact video setups, I would be hard pressed to look further than the Rode VideoMic Pro. 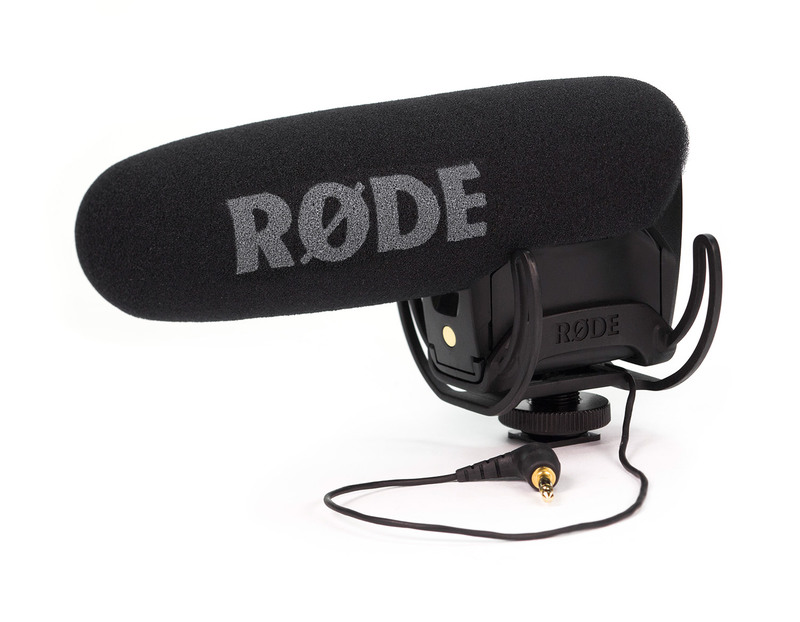 RØDE has taken the feedback from the older model and have created a product that should be in every portable kit. And because of its great price point, superb quality, ease of use, and overall usefulness to any videographer, I’ll gladly give the RØDE VideoMic Pro a Geek Beat Editor’s Choice Award. From my first time using the RØDE VideoMic I was really impressed, it immediately became my on camera DSLR microphone of choice. Not any more, I am now using something that's even better. The new VideoMic Pro! It has taken what was good about the VideoMic and improved it in all areas. Size, features, suspension and most importantly the sound quality are hugely improved. 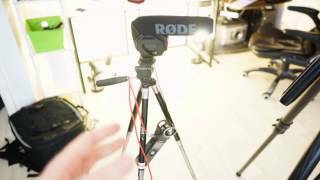 This is a must have for any DSLR video shooters! This is a great sounding mic, offering good, clean audio, straight from the camera. I also prefer the size and build of this mic to that of its predecessor. You’ve got to give it to RØDE — they’ve obviously been listening. A combination of ultra convenient form‑factor, low weight, high sound quality and low price make the VideoMic Pro a great buy in the entry‑level shotgun market. 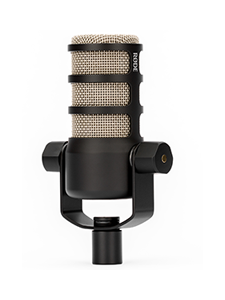 This super-cardioid condenser mic from Rode offers a compact design with excellent polar sensitivity to the front and sides. This makes voices clear but natural. Ambient sound is nicely controlled with the High Pass Filter switch, and the clever shock mounting helps to minimise sound from movement and handling the camera. Your EOS has no option to control the sound level but this mic does; we turned it down to -10dB when recording loud music, but when recording quiet talking, we turned it up to +20dB for superb signal-to-noise handling. The RØDE VideoMic Pro turns out to be a videographer's best friend. It's easy on the wallet, a snap to carry, and gets the job done. It easily wins our Street Smart Editors' Choice Award. Give it to RØDE to make an already amazing product that much more amazing. 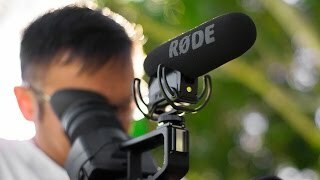 The RØDE VideoMic Pro, the spiritual successor to the ever popular RØDE VideoMic took all the things that made the original shotgun microphone of choice for so many videographers and musical artists great and made it better. 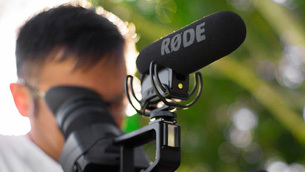 RØDE really took into consideration the complaints and suggestions of the people who used the original VideoMic and added these features into the new Pro version. 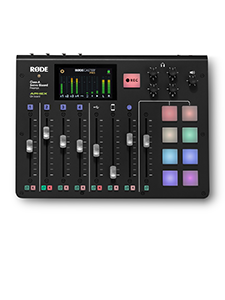 Features like broadcast quality audio capture, adjustable dB input (-10, 0, +20) and the ability to cut out low frequency sounds with the high pass filter, all in a form factor significantly smaller than the original model. Even the shockmount has been updated and shrunk to make whatever rig you are putting it on that much tighter and lighter without sacrificing quality sound... For the new size of the device and the features it has, it's well worth the extra money. Overall no camera rig would be complete without it. Pair this up with a Zoom H1/H4n and you've got a pro audio solution comparable to most industry standard audio solutions. If you have a tight budget but looking for the best quality sound for money you can't go wrong with the RØDE VideoMic Pro. The VideoMic Pro is AWESOME. I own both the VideoMic and VideoMic Pro and the Pro model is such a nice upgrade. 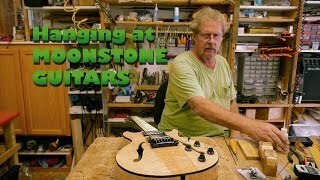 I particularly like the size and look of the Pro model but the sound is stellar. That's not to say that the VideoMic was bad...because it's not. It's like on a scale of 1 to 10, the VideoMic was a 9 and the Pro model is a 10. You guys hit a home run with this model and I get a lot of people asking questions about it when I'm shooting. Of course, I'm encouraging them to get one of their own. It's a great price for an excellent mic. The sound is a big improvement over the built-in mic on my Canon HF200 camcorder. I think this product is a winner. Let me say in the trials I have done with the VM Pro to use the good Aussie expression: "It's a bloody good mic!" I cannot express enough how good this is and that's why I ordered two! Been using the VideoMic Pro on a shoot in the US for the past two weeks and couldn't be more delighted! Absolutely fantastic product and couldn't be happier with it! Have to say I'm liking the mic a lot already. I shoot with Canons (7D, 60D) and much smaller Panasonics (GF1, G2) and the form factor is absolutely spot on. 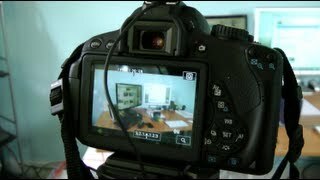 I use the VideoMic Pro with the Canon 7D. Its small enough to fit in my cmaera bag and sounds as good or better than the Rode NTG-2. The shock mount is perfect too. Having the option to record at -10, 0 , and +20 dB is also very nice. I'm very pleased with the quality that this mic offers without being very big in size or budget, deffinantly a great buy! I bought this to use on my t2i. 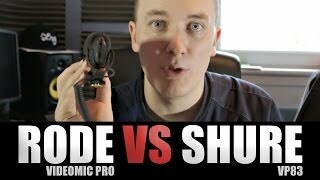 I got the VideoMic Pro rather than the standard VideoMic largely because of the size. It's much less conspicuous, and much less bulky. The sound is a gigantic improvement over the onboard mic. For people who want quality sound, but aren't audiophiles, this is a fantastic buy. Never used a video mic before. I used VideoMic Pro on a 5DII. The mic was about 20 feet from the bride and groom and they were facing away from the mic. The recording was perfect! I could hear the bride and groom as if I was standing right next to them. I thought the design and build quality was very well done. I also received extra shock bands. The size of the mic was nice and compact. I'm very happy with the purchase. We're using this microphone on a Nikon D7000 for mostly family videography and really love the build quality of this product. Its audio performance is astonishing and is recommended to use instead of a built-in mic. It doesn't feature stereo, but the mono is put on both channels, so there's no downside to that. It sounds very clean and has many options (filters, etc) to adjust it to exactly your needs. We picked this one over the non Pro version because of the shorter build length and the new rubber band design. It was worth the extra money. Comes with a few extra rubber bands in case they break. I just wrapped a three day video shoot in D.C. using this mic. It performed very well shooting on street corners and in noisy situations. The +20 db boost was amazing, it allowed me to turn the camera gain almost completely off. I used this mic, converted to mono along side a mono wireless LAV, into a dual mono to stereo adapter, into camera. I resplit the two mono tracks and mixed them in post. The result is a perfectly natural sounding high quality clean audio signal. Don't let people tell you that you can't get great in-camera audio without breaking the bank.